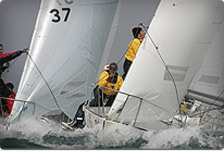 Mauricio Santa Cruz is on the verge of being crowned the 2012 J/24 World Champion. With nine races in the books, Bruschetta holds a 42-point advantage over its closest competitor. 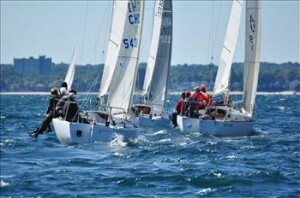 In the 96-boat fleet at the Rochester Yacht Club in New York, Santa Cruz has led from day 1 of the week-long event. On Thursday, he tallied a 19 and 3, but after dropping the 19, he has notched seven top-10 finishes and a 13. No other team has approached the consistency exhibited by Bruschetta this week. With only one more race to go, the battle is for the remaining top spots, with only two points separating second through fourth place. Mike Ingham’s 11th Hour Racing of the USA has 81 points, Nicolas Cubria’s Elvis of Argentina has 82 and John Mollicone’s 11th Hour Racing of the USA has 83. 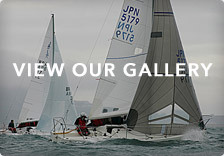 In Thursday’s first race, American Will Welles won his second race of the regatta on Cougar, trailed by Mollicone and Matias Pereira’s Luca of Argentina. In the day’s other contest, two U.S. teams collected the top spots—Peter Bream’s Team Tarheel and Mike Marshall. Santa Cruz grabbed third. 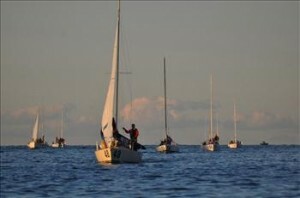 Winds on Lake Ontario ranged from 6-16 knots offshore, providing relatively flat conditions. A twenty-degree oscillation throughout the day allowed for several lead changes. Racing concludes on Friday, and one more race is planned. 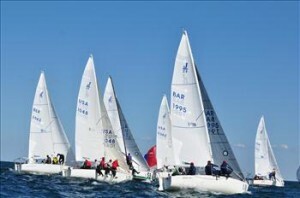 Live updates are available at www.2012j24worlds.com.